BRISBANE, Australia (AP) — A bystander dressed only in underpants helped police arrest an unlicensed driver who allegedly crashed a car into an Australian takeout restaurant on Thursday then fled. 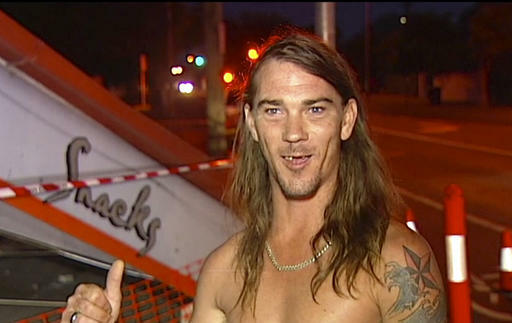 Daniel McConnell said he was lying in bed at home in the Brisbane suburb of Hendra at 2 a.m. when a car slammed into the front of a neighboring fish-and-chips shop, which had closed for the night. “I’ve come outside and I’ve seen all of this commotion over here and I was in me jocks,” McConnell told Australian Broadcast Corp., referring to his briefs. McConnell said he saw the driver run away and gave chase. “All I had was me undies on and he started to take off up the street and I said: ‘What are you doing, mate?’ and I started following him. He’s like: ‘Don’t be a hero,'” McConnell said. McConnell said he returned home to grab his keys then gave chase again in his car, still nearly naked. Police arrived and McConnell flashed his headlights to grab their attention. Queensland state Police acknowledged that McConnell had directed them to the street where the 35-year-old driver was arrested. The driver will appear in court in January charged with unlicensed driving, a police statement said. More charges are possible. Tags: Australia, bystander, Daniel McConnell, police, underpants. Bookmark the permalink.